Here’s the thing about meditation: while it's a pretty straightforward practice, the excessive amount of information available to us tends to complicate our understanding of what it really is. Therefore we'll cut to the chase and get you into practicing. If you’re a beginner, this is the right place for you. If you’re already familiar with meditation, this is an excellent place for you, too. Apprehensive beginners out there are in dire need of people like you to carry the message about meditation. How Do We Define Meditation? Concentration is when we focus on something specific like the breath, the sounds outside, or music. Sitting cross-legged, focusing on the breath coming in and out of your nose, for example, is a form of concentration. Meditation, on the other hand, is the state of mind that we attain as a result of concentration. It is a more rare occurrence and is extremely unlikely for an everyday person to attain. This is good news! That means there’s no pressure for you to reach this nearly unattainable state because you'll be engaging in the much more flexible and equally beneficial practice of concentration. But, for the purposes of this guide, we’ll refer to “concentration” as “meditation,” in an attempt to simplify an already overly-complicated topic. Being informed is the first step in beginning a new habit. If you're overwhelmed by the cacophony of sources out there, you're not alone. It can make meditators of any level scratch their head. The information you choose to believe about meditation and the types of meditation you experiment with is really up to you. The basic gist of it is, take what you like and leave the rest. If you find something that works particularly well for you, go with that! If you find something that you have a distaste for, leave it behind! As you can see, there are elements of meditation that are nothing more than common sense. In time, your meditation practice will be a beautiful, colorful and ever-evolving bag of potpourri that is uniquely you. How Do We Start Meditating? Let’s begin building your practice, shall we? Today, you’re going to meditate for one minute. That’s right. Your meditation practice is born, or reborn, right freakin' now. Part of the reason so many of us get intimidated by meditation is that we think it takes too long and that it might take us away from one of our many “important” daily tasks. Consider this here and now: you have no time to rush. In every moment of every day, there is an opportunity for wonder, and for growth. In every moment of every day, there’s also an opportunity for detachment and distraction. By the end of your days, how will you have spent the majority of your moments? I challenge you to complicate these instructions, I don't think it's possible! The truth is that they’re meant to be simple. You might think that one minute is too short to make any difference. That’s quite understandable, because it is. However, one minute is the perfect amount of time to begin, especially when it comes to meditating. By starting with a one-minute goal, you’re guaranteed to set yourself up for a small victory. Having an intention to meditate for 60 seconds is less intimidating and more achievable than aiming for an extended, more intense session of 20 minutes or more. This way, you maintain your focus and produce better quality of meditation. At some point in your practice, after a period of consistency, you will be able to meditate for longer. But the start of that consistency begins with one single minute. One of the most insidious barriers to healthy meditation practice is the mindset that it should last a lengthy amount of time. Don't let the mental barrier limit your abilities. Instead, start in the space of open-mindedness for the one minute you will spend today meditating. Once you find your comfortable seat, close your eyes and begin to recognize that you are breathing and you will have officially meditated. Each day you continue to practice--say tomorrow--try two minutes and add an additional minute each day thereafter. Sitting is of utmost importance although it seems to be overlooked. The traditional sitting posture for reflection, that one where you're cross-legged with your hands resting somewhere on the legs or in prayer position, is NOT a natural sitting posture for westerners. While there’s profound value to this posture, which in yoga is referred to as sukhasana, it takes time to build up to it. Kneel on the floor using a folded blanket, pillow or bolster to wedge between your calves and thighs. Keep your legs perpendicular to the floor, and touch your inner knees together. Gently slide the feet a bit apart, slightly wider than the hips, with the tops of the feet flat on the floor. Finally, take a soft seat between your feet. If you need more references to what this should look like, this is a useful resource and includes even more details. In yoga, this is called hero pose or virasana. It's a great way to get into the practice, and not fret about the myriad choices before you. After you get yourself seated, it's then a matter of doing it--often. Another important step you can take to remain consistent in your practice is to meditate at the same time every day. It’s helpful to pair your training with another activity that you already have formed a habit around. For instance, many people meditate right before or after brushing their teeth. Others like to do it right before or after breakfast. Inconsistency is a significant barrier to a healthy meditation practice. Regarding what time you should, you'll get the most benefits in the morning. The reason for this is that our minds and bodies are well-rested and have not yet been influenced by the many external factors we face throughout the day. It’s also just an excellent, productive way to start your day off on the right foot. That isn’t to say that afternoon or evening meditations won’t be beneficial. 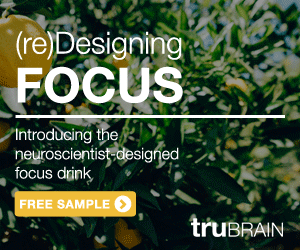 You could always implement truBrain, giving you that added brain-hack for more focus. Otherwise, any time is still beneficial and if those times seem to work better for you, then have at it! Meditation is a personal journey, and in the beginning, there’ll be a trial and error period until you reach your unique preferences. Now you're informed about what meditation is, how you can begin, how you can mitigate distractions and nurture your practice on a regular basis. Go you! So, have you achieved your one minute of meditation today yet? If you have, share your experience in the comments. If not, what's holding you back? It's only a minute afterall!